July has been a scorcher with some beautiful weather and a record- breaking heatwave. 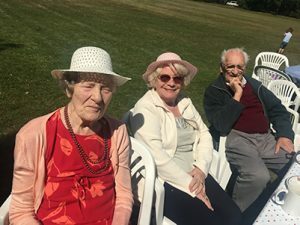 Here at Elmfield we have been taking residents for walks in the mornings as it has been too hot in the afternoon heat. The duck pond has almost dried up after so long without rain therefore the ducks seem to have flown away. 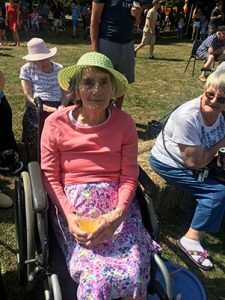 We have consumed lots of ice creams and ice lollie’s to try and keep cool but the hot weather has made our residents a bit hot and bothered and caused swollen feet too! 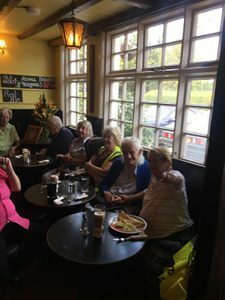 Our pub visits have continued each fortnight and are now more popular than ever! We now take over the whole of the downstairs of the pub! Residents are getting experimental with their meal choices now too. Pub lunches are a highly anticipated social event. The lovely weather has enabled us to attend all of the ‘Teas on the Rec’ this month. This has been such a busy local event and there are sometimes hundreds of people there. A large group went across to the BBQ at ‘Teas on the Rec’ a couple of weeks ago, this was a wonderful afternoon/ evening with the only downfall being that they didn’t have any vegetarian snacks at the BBQ. 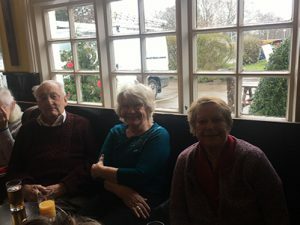 We also held our quarterly ‘Residents and relatives meeting’ earlier this month. It was a pretty quiet meeting but thank you to those who attended. Meeting minutes will be sent to relatives with your monthly communication packs. Mid- July we had hopefully the first of several visits from a choir. They brought their own instruments and performed for us in the lounge area. 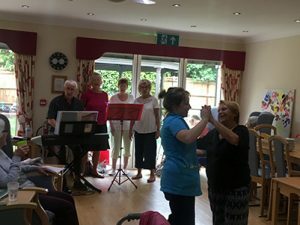 They sang a wonderful mix of melodies and the feedback from the residents was all positive. The choir have confirmed that they would like to come back to Elmfield again in the future. Our monthly church service from Bisley pastural assistants was well- attended. Bailey our PAT dog continues to visit. However, his owners have requested that residents do not feed him biscuits or chocolates as they are poisonous to dogs. We are looking forward to our first BBQ for residents, friends and families of Elmfield. We will be holding a BBQ in the garden on Saturday 11th August. People will be contacted before then with invites so that we can have an approx. number of people attending so that we can buy correct quantities of food. All are welcome! In August we will be having Elvis in the building. We will be having a performance by Chris who is a very talented Elvis tribute. Date to be confirmed but keep an eye out for posters as it will be a show not to miss! Niccii will be giving dates for people to become ‘Dementia friends’ so if anyone is interested please check the notice board for dates. We have had several changes to the staffing team due to unforeseen circumstances. Sadly, we have lost one of our seniors Lisa Matthews who has relocated closer to her family. Erin Russell one of the day carers has relocated due to her military husband being posted away. Samantha Franklin has left to pursue a career related to her degree. Fanelli Thaddeus from nights has also relocated due to expensive accommodation costs in this area. All the above will be missed at Elmfield. Sarah Daley has joined the bank staff team and will commence induction in August. Jade Gunn one of the bank staff is joining the night staff team. Other vacancies are currently being advertised and we look forward to seeing new more new faces in the future. 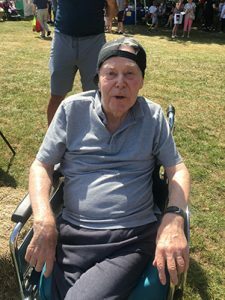 We celebrated John Notley’s 89th birthday on 27th July. 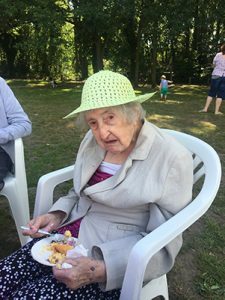 He enjoyed his day with friends at Elmfield and had a birthday tea party in the late afternoon. August is a busy month for birthdays……. Our new senior Pamela Monge Coto is settling in very well and will be an asset to our team. Well done to several members of staff who have signed up for NCFE distance learning courses. The majority of staff have had positive feedback to say that they have passed their first units. 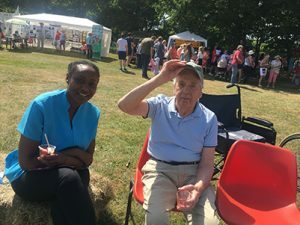 It is great that so many staff are choosing to develop themselves professionally; it really does help staff to better understand and accommodate for the residents with the more knowledge they have. We are currently in talks with West End day centre to take some residents there with staff two mornings a week. They will be picked up on the Parish mini-bus and brought back too. It may be something of interest to our residents. We will be changing Opticians to Eye Concern which is a family- owned opticians with values person- centred around the resident. They also provide excellent staff training, free engraving and much better paper work for care plans as well as liasing directly with families.